Cute boys in crew cuts, day-glo surf bars. But her teeth look like smashed-out window panes. With sushi and facials and carrot juice. There’s a wide wall we can’t see over now. That’s OK, we’re still learning. Mistakes, they are allowed if you’re a satellite. Yoga classes so you can look good in your singles bar. California’s sure lovely; it’s the home of the stars. Volleyballs and Valium and Power Bars. Our hearts are on shelves. But we can fix satellites. ‘Cause in Hollywood the heroes are strung out on grace. That we can’t see over now. But that’s OK, we’re still learning. We can fix a satellite. The pope can’t fix my broken heart. Rock’n’roll can’t fix my broken heart. Valium can’t fix my broken heart. Miss Cleo can’t fix my broken heart. But will you fix my broken heart? Will you fix my broken heart? ‘Cause I’m going to give you a satellite. Satellite, a satellite, a satellite. So I wrote in my post-Jewel-concert blog post about how she sang a song that she’d written about Huntsville, and how it was more than a little cool. I saw on Twitter yesterday that she’s posted all of the city songs she wrote for her tour online as free downloads. Good stuff. Go check ’em out! 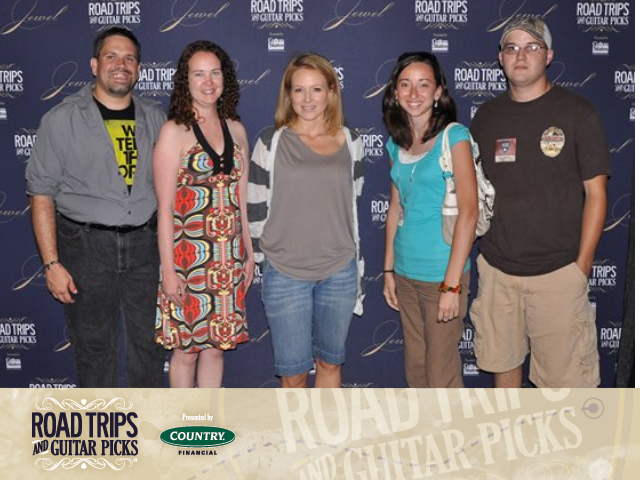 This post is one of a series I’m writing as part of my participation as an official blogger for COUNTRY Financial/Cotton States’ Road Trips and Guitar Picks tour program, covering Jewel’s June 13 concert in Huntsville, where I’ll have backstage access. This once-in-a-lifetime experience includes a backstage performance by Jewel, a question and answer session, and a group photo with Jewel. The Backstage Experience will also include a hospitality menu of hors d’oeuvres and beverages. You will be escorted back to the theater to enjoy the show. So, yeah, I’m kinda excited about it. I’ve probably said most of what I have to say about it over the last couple of weeks, though I’m sure I’ll have more to say after. I didn’t realize how close Jewel and I are in age until very recently, and so I’m looking even more forward to the Q&A session because of that. There are a handful of artists that I really like that are about my age, and it’s been really neat to follow them as they’ve matured along with me. From the sound of Sweet & Wild, Jewel’s at a really great place in her life right now. On a side note, my friend Heather is also going with a friend of hers to the concert, and challenged me to a bet as to whether or not Jewel will perform her version of Sweet Home Alabama tonight. I’m taking the stance that she will, based on other concerts I’ve been to where the artists have played their songs about the place they’re playing. At stake, homemade blackberry cobbler. Neither one of us has ever made blackberry cobbler before, and I really can’t cook at all, so it should be an interesting bet. (A year ago, I made a big bowl of “blackberry thing” that kinda resembled cobbler. In my defense, kinda, it wasn’t supposed to.) Could be a pyrrhic victory for my office-mates if I lose, so root for her to sing it. 1) Based solely on the title, when I went to listen to No Good In Goodbye, I was expecting something a little more like Juliet Turner’s No Good In This Goodbye. My expectations couldn’t have been further off. Rather than being slow and mournful, No Good In Goodbye starts the album off on a surprisingly upbeat tempo. (Of course, I’ll admit the opening lines drew to mind another song, Like A Rolling Stone, with Jewel’s “Once upon a time used to feel so fine; I really made you shine …” intro.) As best as I can tell, she’s heartbroken, but she’s still pretty peppy about it. I looked for lyrics, and could only find words to another unreleased Jewel song of the same name. That said, pretty catchy. 2) I Love You Forever — Couldn’t find lyrics to this one either. Did find where someone had attributed Donna Lewis’ “I Love You Always Forever” to Jewel mistakenly, but that doesn’t help. Separated lovers, but the devotion-across-the-distance makes the upbeatness make a bit more sense. And, dang it, I do like peppy songs. 3) Fading — The song involves Jewel naked in the Wal-Mart bathroom. I’m just saying. Reflections on mortality and mundanity. But still peppy, dang it. That should bother me, maybe, but it’s just too peppy for me to complain. “I am fading, just like fairy tales, when the hero loses faith.” But I’m OK with that, you know. Might seem more unrealistic if that wasn’t kinda where I am in life. 5) Bad As It Gets — OK, the name promised something a little more downbeat. And while the chorus is still kinda rousing, it’s not exactly peppy. “Is this as bad as it gets tonight? Tell me I’ve seen the worst of this jagged knife deep inside my broken heart, it’ll only leave a scar.” Lori McKenna would sing this song in a way that makes you want to carve out your heart with a spoon rather than feel anything else. Jewel makes it kind of fun. And, again, I’m OK with that. 6) Summer Home In Your Arms — “Oh Jesus, this love stuff can sure be scary / But so sweet… So sweet.” Jewel slows things a bit with this song, that sounds exactly what it’s describing — sweet and easy and relaxed. 7) Stay Here Forever — I must have heard this song when I watched the movie Valentines Day, but I don’t remember. That said, I like it. Halfway through the song, halfway through the album, this track strikes me as one that will be a personal favorite, though I don’t know exactly why. What the song’s talking about, I want that. 8 ) No More Heartaches — After the return to peppy on the last track, Jewel stays in that vein with this peppy break-up song, but it works — “There’ll be no more heartaches for me.” For some reason, my initial reaction to this song is that I have no initial reaction to this song. I have a feeling I’ll develop a strong opinion about it at some point in the future. 10) Ten — Yep, the song shares its name with its place on the album. Clever, huh? OK, at this point, this album as a whole is just kinda peppy. I like that. I’m gradually getting into country music, which I guess is true of Jewel, too, but I’m glad that there are two of us who don’t believe that some portion of every album has to be a bummer. 11) Satisfied — OK, I don’t know that I concur with Jewel’s assessment that “Cause the only real pain / Your heart can ever know / Is the feeling of regret / When you don’t let your feelings show.” And the album ends on a non-peppy note. But not a bummer, either. Kinda anthemic, maybe? At this point, the concert is getting close, so I’ve been digging out my Jewel CDs to get ready for Sunday night. I’ll be honest — my knowledge of Jewel’s music fades a bit over the years, from knowing her first album backward and forward to having never heard her country stuff, a fact that has had as much to do with the genre as with Jewel herself. Until recently, I didn’t listen to country, so when she went there, I didn’t follow. Now, being a bit more turned on to country music, I’m looking forward to the melding of the two. While I’m refreshing myself on her work, I thought I’d write a post revisiting some of my favorites. Like I said, my greatest level of familiarity is with Jewel’s first album, Pieces of You , starting with the first single, Who Will Save Your Soul. This album came out at a time when it was still pretty common for me to listen to albums as albums, instead of the modern era of ripping tracks individually to a computer or media player, so I listened to these songs a lot. “Save Your Soul was fun and catchy and eminently listenable. In fact, this song gets two entries in this list, a second for the VH1 Storytellers version which culminates at the end with Jewel just having fun vocally. “When the kitty wants some ooooh it goes meow meow … meow.” Just a light bit of froth, but it still amuses me years later. You Were Meant For Me was another of the singles from the first album. I wasn’t quite as passionate about it, but did like it, and I have a very funny story about my good friend Lain and I accidentally flirting with each other to this song during Jewel’s performance at Lilith Fair that I’m not going to tell on the blog right now. Ask me sometime. I bought Jewel’s album Spirit the week it came out on audiocassette, but, to be honest, all these years later, I remember it for two main things. One is that any time I hear the title, I immediately thing, a la Nirvana, “Smells Like Jewel Spirit” (sorry, Jewel). The other, of course, is the great first single, Hands. I don’t think I bought This Way when it came out, but I’ve always had a fond place in my heart for Standing Still. Good stuff. Yeah, I still think of the Schick commercial when I hear Intuition, but, you know, that really doesn’t make the song any less awesome. Dear Jewel, when you come to Huntsville Sunday, since you’ll actually be in Alabama, would you be so kind as to perform your version of Sweet Home Alabama? I’d be ever so grateful. And then, the song I skipped. I don’t know exactly why Foolish Games is far and away my favorite Jewel song, but it is. To the point where I was terribly excited when I bought the album and discovered the album cut had a verse not in the radio version, meaning that there was even more of Foolish Games. Is it the awesome piano bit? (I’m a sucker for female singer-songwriters with pianos, what can I say?) The slow, brooding way the song unfolds? The lyrics? The fact that even then I so wanted to be the guy in the song? I mean, you know, he’s like the bad guy, and yet still awesome. The Han Solo/Rhett Butler bad/good/compelling archetype in five minutes of piano brood. OK, I’m gonna shut up now. This is kinda embarrassing. I’ve actually seen Jewel in concert once before. 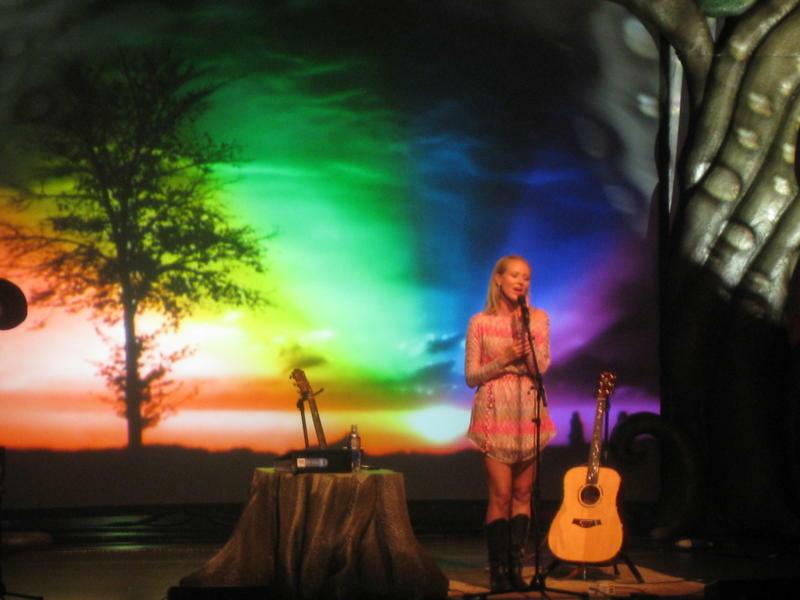 I wrote recently about the fact that I’m going to Jewel’s June 13 concert in Huntsville, and that I’ll have backstage access as an official blogger for COUNTRY Financial/Cotton States’ Road Trips and Guitar Picks tour program, which gets fans involved in the concerts — you can become a Roadie to be eligible for prizes, and there’s a sweepstakes to win an all-expense-paid trip to one of the concerts. The line-up for the 1997 Atlanta Lilith show was rather impressive — starting with then-current one-hit-wonder Abra Moore (“Four-Leaf Clover”), Susanna Hoffs of the Bangles, then-hot Fiona Apple, Joan Osborne, Emmylou Harris, Jewel and Sarah McLachlan. The first three acts were lagniappe, but were fun. Joan Osborne and Emmylou Harris, I wish I were seeing now instead of then. They both put on great shows, but my musical tastes were still far too immature to really appreciate them. At that point, I still knew Joan Osborne solely from the “One Of Us” song, which is probably the least Joan Osborne-y song there is. I’m practically kicking myself over the great songs I must have just sat through waiting for her to play that. Emmylou Harris, I doubt I’d even heard of before Lilith Fair. Ah, the folly of youth. And then, there was Sarah McLachlan and Jewel. This being Lilith Fair, Sarah McLachlan was closing act. This being late 1997, Jewel was the superstar. To be honest, me being a huge Sarah McLachlan fan, I was more interested in hearing her, even if Jewel was the bigger name at the time. And, to be sure, Sarah didn’t disappoint. She earned her place in the closing slot. Brilliant show. But this post is about Jewel, right? Point being, though, her debut album had been out long enough that she was already looking ahead to the future, and a decent amount of her concert was new material. Now, keep in mind, this was very early folksy ingenue Jewel, whose then-only album had a song with the lyrics, “So please be careful with me, I’m sensitive / And I’d like to stay that way.” It was her, and she made it work, but it’s hard to think of an artist more precious than Jewel at this point. But that night, at Lilith Fair, she rocked. She did the “Pieces of You” hits, and they sounded like the “Pieces of You” hits. But she did a lot of songs I didn’t know. And they rocked, awesomely and with a great rocking. At the time, I assumed they were material for her next album, but when Spirit came out, more than a year later, I didn’t recognize any of them. Now, maybe they were on there, and it had been long enough that I didn’t recognize them from the live version I’d heard. Maybe she was doing covers that young, musically immature me didn’t recognize. Maybe they were songs she was working on and decided not to go with. I have no idea. All I know, was for that one night, Jewel put on a show that was great in the ways I’d expected, and great in totally unexpected ways as well. Now, I’m certainly not going into this upcoming concert with that sort of expectation, but, I will admit, from having seen her before, I am kinda excited about seeing what she’s going to do this time.